As all those who have the first edition of this book know very well, apropos of this question, I had written words which were rather clear: “As far as the different character and personality which Barolo can assume on the basis of the soils is concerned, the pairings Tortoniano/elegance and Serravalian/power, often to be found in the literature dealing with the zone, are to be considered, in my opinion, simplistic, even an outright fallacy. And, to perceive this, it is sufficient to compare a Barolo Brunate with a Barolo Monvigliero, both part of the Sant’Agata Fossili marls, or a Barolo Villero with a Barolo Rocche di Castiglione, both representative of the Diano Sandstones." Since then, although it is true that my opinion has not changed, it is equally true that I have had many requests for a more in-depth treatment, and equally frequent have been the occasions in which I have personally verified how much confusion reigns in this matter both among professionals in the field and wine lovers. For this reason, much assisted by the sup-port of two respected professionals such as Edmondo Bonelli for the geological questions and Gian Piero Romana for viticultural matters, in addition to Francesco Dellisanti for the mineralogical aspects, I decided to accept the challenge which they themselves proposed to me and produce a document which – thanks to their scientific contribution and my journalistic and editorial “filter” – would attempt an unambiguous, easily comprehensible, and, to the maximum extent possible, complete description of the complex geology of the Barolo production zone. Given the task of confronting a question as complex as the geology of the Barolo production zone, the best thing to do is to proceed gradually, placing the accent from time to time on the most significant aspects and attempting to clarify, with simplicity, certain concepts too often taken for granted. First and foremost, what today we can see and admire was once the floor of the Ligurian-Piedmontese Tertiary Basin, or that arm of the sea which, during the Miocene, covered a good part of current day Piedmont with the exception of the Alpine chain and the Ligurian Apennines. Consequently, all of the geological formations which we will be analyzing, and a good part of the soils associated to them, are of sedimentary marine origin. From an analytic point of view, two parameters are of particular significance when we confront them with other viticultural zones: the pH and the percentage of active lim. The first, normally between 7.7 and 8.3, identifies soils as alcaline or sub-alcaline or, more generally, basic (in Alto Piemonte, where the cultivation of Nebbiolo has a similar tradition as does, moreover, Lombardy’s Valtellina, the soils, instead, are acid with pH values even much below 6). As far as values in active lime are concerned, they normally range from 7% to 12% and are to be considered significant however not as characterizing as they are in other viticultural areas (e.g. in Champagne). If the sedimentary marine origin represents the geo-logical basis of these various formations, the epochs in which they originated are various and successive in time (each of which is defined technically a stage, e.g. Tortonian, Serravallian etc.). Different stages imply different lapses of time and different manners of sedimentation, and consequently differences which are also substantial in the physical and chemical characteristics of the individual formations. The oldest (the Lequio Formation), formed when the Ligurian-Piedmontese Tertiary Basin was deeper, is characterized, for example, with greater frequency by coarse particles strata, while the younger ones (the Sant’Agata Fossili Marls), formed when the basin was in the process of disappearing, have instead finer textures in that the sedimentation took place in calmer and shallower waters (even if, apropos of this, as we shall see further on, there are no lack of exceptions). Given this premise, and if nothing else had occurred, the older formations would be located to-day in the deepest strata of the sub-soil and would therefore result as being invisible and irrelevant, Quite to the contrary, the movement of the earth’s crust over millions of years has caused a progressive sinking towards the northwest of the entire area and the contemporary emersion towards the southeast of the oldest and deepest strata. It is no accident, accordingly, that, proceeding from west to east, the various formations can be found in perfect chronological order, from the youngest to the oldest, as can be seen from the sketch in the previous page. Given that various key terms such as sandstone, marl, and formation have already been used, and will be even more utilized in the next pages, it is a good idea to clarify them immediately and explain their meaning in the simplest way possible. Beginning with sandstone, this term is intended to describe a rock composed principally by sand. Sand which can remain loose or solidify and therefore be-come hard, forming in this way compact rocky strata which are locally called “Pietra di Langa” (Langa Stone). In its most classic – or, perhaps better, ideal – form, sandstone is composed by alternating strata of sand and Pietra di Langa, whose thickness, in the case of the Arenarie di Diano (the Diano Sandstones) which most interest us, can vary from somewhat less than a foot to several meters in the case of the strata of sand and from four to eight inches in the case of the Pietra di Langa strata. The term marl, instead, intends to describe a softer rock which, in the Langhe area, is composed principally by silt and clay and, to a lesser and variable extent, sand and calcium carbonate. These elements, mixed among themselves, then consist of strata of variable thickness which range from a few fractions of an inch (millimeters) to something less than a foot. It is no less important, in addition, to clarify what is meant by formation. This term, in geology, indicates in fact an ensemble of strata which are more or less homogeneous in terms of their geological characteristics and accordingly distinguishable from adjacent ones. The names of these formations often derive from the spot where they come to the surface in a particularly representative way and where they were first studied (Diano d’Alba, Lequio Berria, etc.). 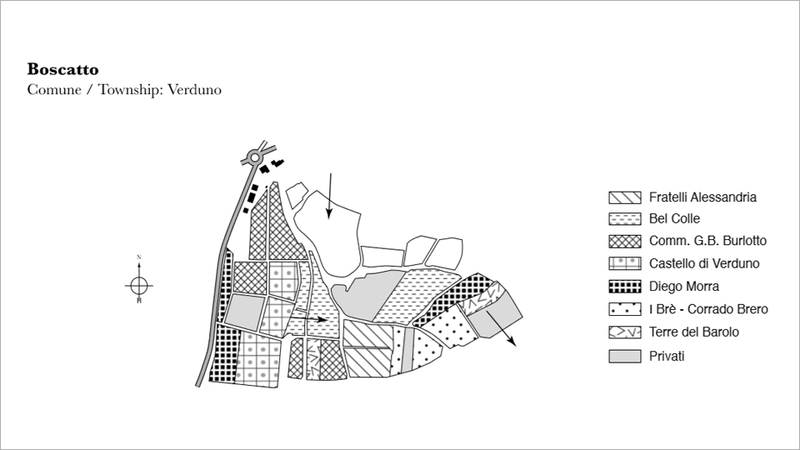 Turning now more specifically to the Barolo production zone, the various formations which can be identified within its confines and which we shall shortly examine in a more detailed way, are not of the same importance, at least in terms of the area they cover. Analyzing, in fact, the map on page 13, it can be noted that the most common of these formations are the Sant’Agata Fossili Marls. On the basis of the relative importance of their various components, we can distinguish in the interior of these marls the clayey marls or laminated marls, the sandy marls and the loamy or typical marls. In terms of importance, they are followed by the Lequio Formation and the Diano Sandstones, even if this last formation, often isolated in the highest parts of the ridges, turns out to be on average less planted to vine. The Cassano Spinola Formation, instead, is similar in terms of extension to the Lequio Formation, while it differs not only in terms of age and composition but also for the lesser steepness of its hillside slopes. Gradually more marginal are the Vena del Gesso (Gypsum or Chalck Vein) Formation, the La Morra Conglomerates, and the Pliocene Marls. No less interesting to underline is the fact that each formation can be linked to a specific hillshape, tied in its turn to the different type of erosion which takes place in each formation. The Sant’Agata Fos-sili marls, characterized by finer sediments, create a gentler and more rounded landscape whereas the Diano Sandstones, normally easier to erode, can be associated with steeper slopes, at times authentic cliffs known locally as “rocche”. An intermediate shape be-tween these two, both in terms of characteristics and landscape, is that generated by the Lequio Formation. Another typical aspect of the landscape of the Langhe is the asymmetrical structure of the hills, which generally present a steeper side (scarp slope) and a softer side (dip slope), which, as we shall see further on, has an important impact on the type of soils to be found. This same structure, then, influences the incidence of landslides. The dip slopes are subject to deep and significant landslides, the scarp slopes to frequent superficial landslides of lesser ex-tension, often tied to sandy strata which cause water to rise from the deeper hillside strata. 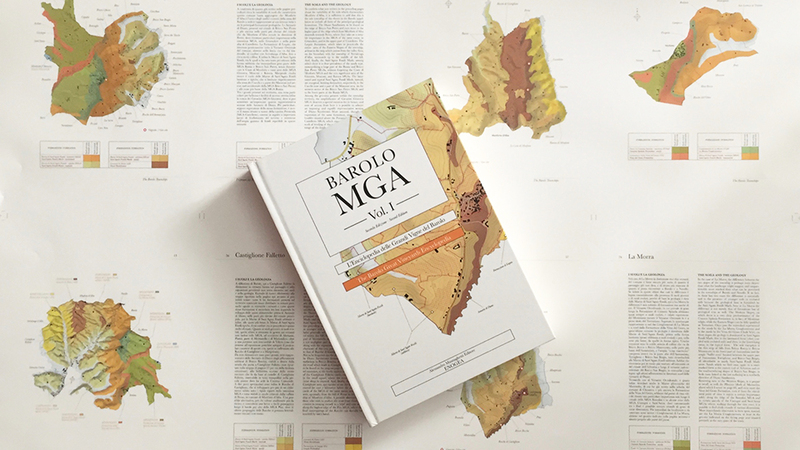 The 2nd edition of Barolo MGA, The Barolo Great Vineyard Encyclopedia is the result of a quarter century of study, unlocking the mysteries of why Barolo's soil produces such profound wines. Representing an incredible 11 years of work, it demands a place in the library of anyone who loves Barolo. And that includes owners of the 1st edition. 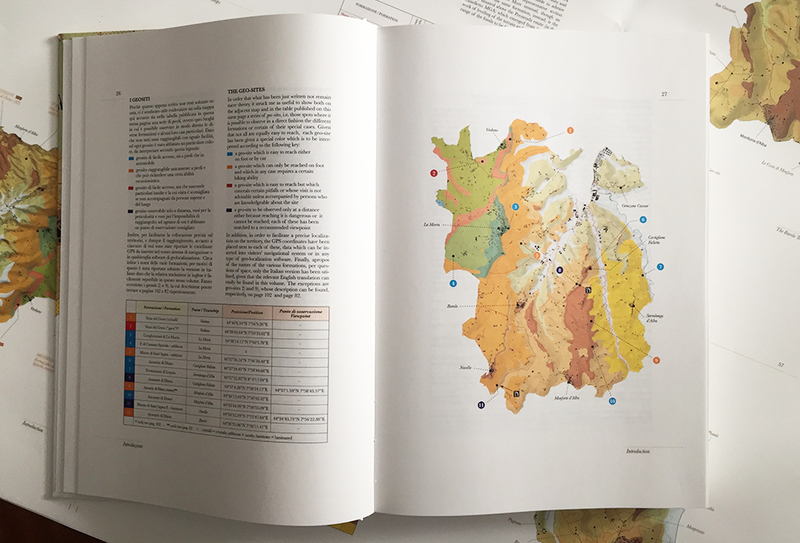 Barolo MGA includes more than 200 3-D images of the region's vineyards; in-depth analyses of the individual communes; 170 fact sheets on each cru and a directory (with contact information) of growers and producers. 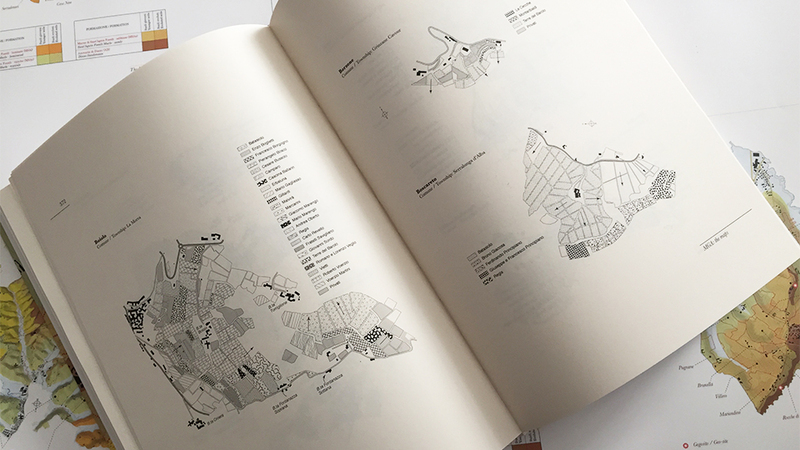 In addition, a glossary demystifies over 750 place names, brand names and historic zones. Just one edition is being published, with text in both Italian and English. Barolo MGA Vol. 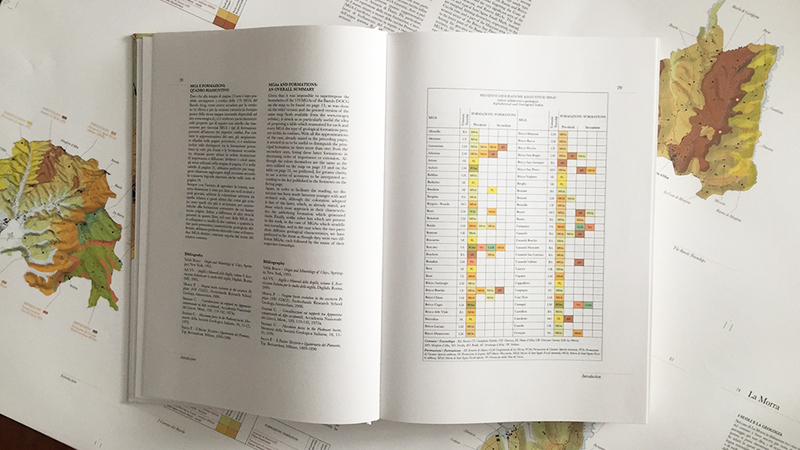 I: The Barolo Great Vineyard Encyclopedia is available through the Rare Wine Co.